The artist’s first solo museum exhibition in the US, Visionary Transformation highlights a selection of 12 paintings from Zheng’s Great Visionary Transformation series made over the last eight years. These works retool imagery from traditional Buddhist thangkas, hanging scroll paintings that serve as meditation tools, typically depicting a central mandala or deity surrounded by disciples and donors. 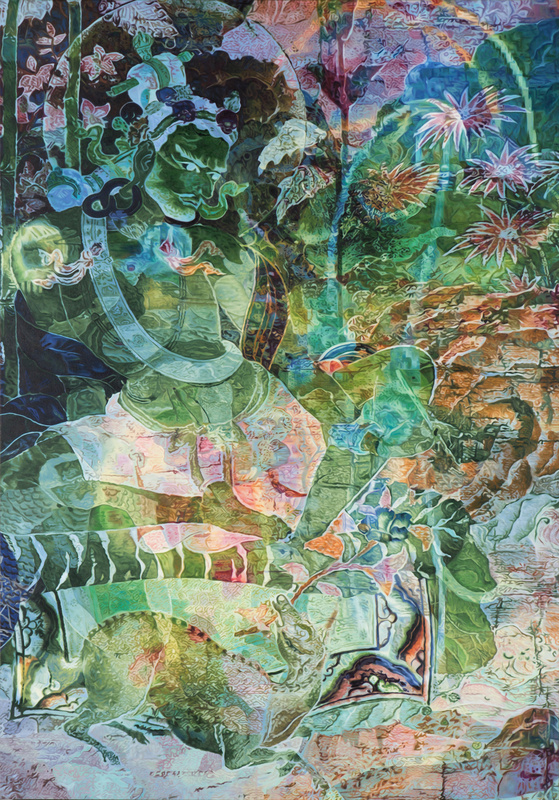 Zheng digitally superimposes multiple thangkas into a single hallucinatory image, which he paints on canvas using a number of different techniques. In their dense and evanescing complexity, these paintings evoke the Buddhist belief in the impermanence of the physical realm, offering allegories for the unstable relationships between systems of power, belief, and history that mark our age. Zheng Guogu lives and works in Yangjiang, Guangdong Province, China. He graduated from Guangzhou Academy of Fine Arts in 1992, and was a founding member of Yangjiang Group, an art collective focusing on experimental Chinese calligraphy, founded in 2002. Zheng has participated in many significant international exhibitions, including Art and China After 1989: Theater of the World, Solomon R. Guggenheim Museum, 2017; Social Factory – 10th Shanghai Biennale, 2014; Farewell to Post-Colonialism – 3rd Guangzhou Triennial, 2008; Documenta 12, Kassel, 2007; Brave New Worlds, Walker Art Center, 2007; and Canton Express in Zone of Urgency, 50th Venice Biennale, 2003. His recent solo exhibitions include The Winding Path to Trueness, Mirrored Gardens, Guangzhou, 2017; Where energy inhabits?, Galerie Chantal Crousel, Paris, 2016; Visionary Transformation, VeneKlasen/Werner, Berlin, 2015; and Ubiquitous Plasma, OCAT Xi’an, 2015. He received the Best Artist Award from the Chinese Contemporary Art Awards in 2006.